Odds and ends lead to something spectacularLet me set the scene for one of my greatest all-time culinary masterpieces: Sunday evening, hangover fading (slightly), a produce bowl brimming with odds and ends (I keep most of my non-fridge stuff in a wooden bowl on the counter) and a third of a bottle of delicious red wine that I had no interest in drinking. 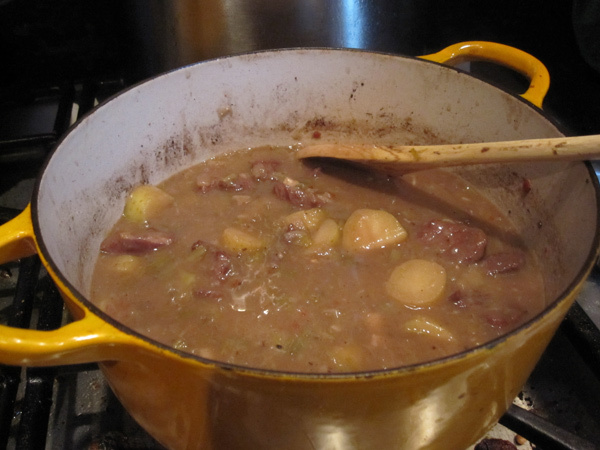 Looking at the disparate elements—and gaging my energy level—I decided to make a stew. It turned out awesome. First I pulled some Birchrun Hills Farm veal cubes (given to me in the course of PASA research; a little meat payola) out of the freezer and let them defrost. I then seasoned them and browned them in my little yellow dutch oven using some olive oil. It took two batches. Once the leeks and onions looked silky and translucent, I added chopped garlic (three wilty garlic scallions and about four small chopped cloves; I like garlic) and a large pinch of crushed red pepper flakes. After giving that 3 to 5 minutes to cook, I tossed the meat back in the pot along with some chopped fingerling potatoes from the Fitler Square Farmers' Market that had started to go slightly green. 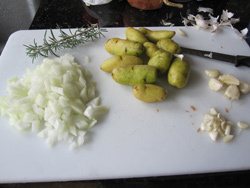 (Considering the small amount of taters, I felt comfortable with the poison risks. Maybe I'll build up an immunity.) I added salt and pepper along with a sprig of rosemary from my windowsill. Then came the wine (a California Zinfandel) and a bit of chicken stock (tragically, not homemade). I covered it and let cook for two-and-a-half hours at a simmer. At the two-hour mark, I removed the lid, allowing the broth to concentrate. I also added a teaspoon of (Daisy) flour, incorporated into some of the sauce in a measuring cup before being added (no lumps that way) towards the end. After fine-tuning the seasoning, I served it with a hunk of Metropolitan Bakery ciabatta brought by my dining companion. I never feel more like an accomplished cook than when I improvise. I don't think its a stretch to say that this was one of the most delicious dishes I have ever made–it was rich and complex, with woodiness from the rosemary, heat from the chili, richness from the wine and tremendous flavor from the wonderful, local meat. I wrote about the basic braising process for Grid a few months ago. Check it out here.